Perhaps you'll try Cleopatra Beach, where the Egyptian Queen herself is said to have once stopped her tour of the Mediterranean to swim; the amazingly blue waters and pale sands set the scene for your beach holiday. After you have lounged on the beaches of Alanya, transfer your mind to years gone by and wonder about to explore the history of the city. With known habitation dating back to the Palaeolithic Era, there is so much rich heritage to experience while here. But, for those who love a good party, your holiday may coincide with some of the major festivals that take place every year here - and the locals know how to party with the best! Every year since 2001, the Alanya International Culture and Arts Festival has been held on the last Saturday and Sunday of May. During this festival, you can travel to Alanya, after getting to Alanya, Bizim transfer will get you to your accommodation and get straight into the festival atmosphere. The festival promotes all forms of the arts (including digital), but there is special attention paid to the more traditional arts that often go by the wayside in some cultures. The city has twelve sister cities around the world that pair up for this event. Representatives from these sister cities often come to the festival and promote their own arts and culture, making it a truly multicultural and multinational locale that is a joy to experience. There are, of course, other festivals that take place in the city throughout the year, including the Alanya Jazz Festival - held in September every year and centered on the iconic vista of the Red Tower. Alanya Jazz festivals take 3 days and every year the date might be changed. For more information, you can visit Alanya Tourism office where is close to the Cleopatra beach. 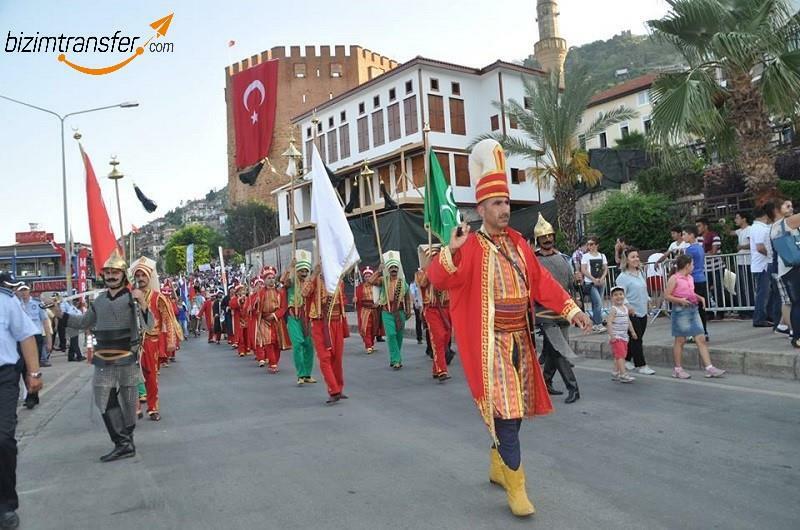 But if you want to try a local festival in Alanya then Orange festivals is for you. The orange festival is held In the nearby town of Oba, there is a small event known as the Portakal Festival held in June; it is a celebration of local crafts and food. There are other tournaments and festivals nearby Alanya such as Triathlon, Beach volleyball, Antalya Aspendos international music festival. If you want something a bit bigger, head to the nearby outdoor theatre of Aspendos for the Aspendos International Festival. This large event is held in the ancient outdoor theatre and presents many high-class performances for those interested in ballet or opera.